96% of customers use discount vouchers. (source) They are a great marketing tool that can strongly impact increased sales in a very short period of time. How can you benefit from this at your restaurant? The UpMenu online food ordering system will make it possible to generate discount vouchers for your customers and to configure them freely. See what benefits this can bring for you. What is a discount voucher in the online food ordering system? You have certainly come across discount coupons handed out in flyers at restaurants. It is also popular to grant discounts at restaurants when the customer says a special “password”. A discount voucher works in exactly the same way in the UpMenu system. 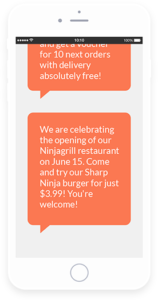 Simply speaking, it is a single discount granted to the customer when they enter a special code when making an order through the restaurant website or restaurant mobile app. The UpMenu online food ordering system enables you to create vouchers as you wish. The voucher may be for single- or multiple-use. You can decide how many vouchers can be redeemed by one customer. You can also define the validity period. The online ordering system will also enable you to choose words or phrases that will activate a discount. Then, instead of random characters and digits, your customers can enter a code that is associated with the brand, e.g. : “BEST PIZZA IN PRESTO”. Discount vouchers are a marketing tool that will enable you to increasing the number of orders in a short period of time. If you want to increase your sales quickly, use discount vouchers. Less busy at your restaurant? Encourage customers to make orders with discount vouchers that have a limited validity period. Discounts that are available only for a short period strongly impact the shopping decision. The online food ordering system gives you the possibility of applying a permanent discount to any customer. You can also award it as a discount code. When the customer enters such a code while placing an order, the discount will be applied to them permanently. Granting a permanent discount can be made more personal than its configuration by the restaurant. You can prepare a special printed voucher and hand it to the customer, or you can send it by email in electronic format. The customer will have to enter the code to redeem it and such a form of permanent discount will certainly be appreciated more. If you would like to promote your own restaurant mobile application, you can use a discount voucher for this purpose. All you have to do is choose the mobile application when creating the voucher, being the device on which it will be available. When you post information on your restaurant Facebook page that you have prepared a special discount for customers ordering through the application, they will certainly download it. Discount vouchers will help you assess the effectiveness of particular marketing channels. Just prepare a few discount vouchers with the same discount but different codes. Post different codes in various marketing channels, e.g. in Facebook ads, in a post on the restaurant Facebook page, on your restaurant website and in the newsletter campaign. Then, you can check which code was most frequently used in the administrative panel of the online food ordering system. This way, you can see which channel has the biggest reach. 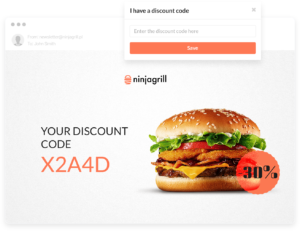 Discount vouchers can be easily generated in the UpMenu online food ordering system and used for increasing profit in various ways. Read the following article: Why does your restaurant need a promotion engine in an online food ordering system? And find out more about the promotion engine available in the UpMenu system.